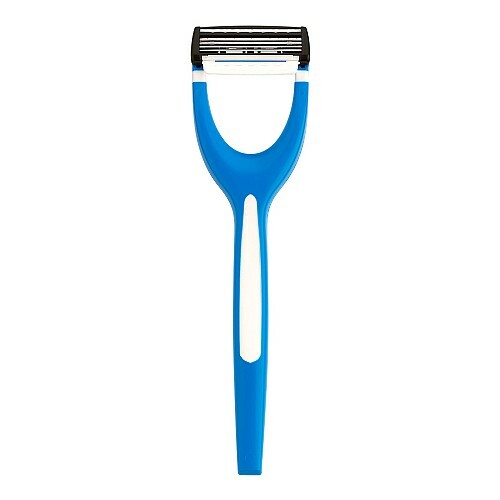 Having recently (and only temporarily) shed by trademark beardage I thought now would be as good a time as any to road test the new AZOR S Sensitive Skin System razor – you know, the one from King of Shaves that looks a bit like one of those flossing tools with with a blade attached? I must say, it was a road test that had me trembling more than Jordan in a Bushtucker Trial. I say this because when I used the original Azor there was a bit of unpleasant bloodletting. Maybe it was my technique, or the fact that I struggled to handle it very well. Or maybe it was just rubbish, I don’t know. But anyway, I am pleased to report no such problems with the Sensitive version (£4.49 from wwww.kmishop.com). I actually used it three or four times to test whether my nick-free shave was just a fluke. But no! Maybe this considerable leap in performance is because of its softer flex, which requires slightly less pressure from the hand to get the job done. Whatever it is, it’s a distinct improvement on the standard Azor. Mind you, it’s still not going near any part of my body other than my chin…. Just goes to show, there’s always groom for improvement. Like the iPhone only gets better, you have my word we have great plans for the Azor, to build on it being the UK’s top selling system razor in the UK in October, bar none. Thanks again for the review. Best, WK.